I will lead the group through a meditative shamanic drumming journey to access nondual wisdom in the “upper world” of Spirit/Oneness. Bring eye shades and pillow for head. Yoga mats or chairs are supplied. Cost is $5-$10 depending on how many come. After the journey, the group will share our experiences with the process. Welcome to you, if you are new to our group! For our monthly gathering on Saturday, March 17, I will offer a 20-25 minute guided meditation. We will then discuss Part One and Two of Amoda Maa’s latest book, Embodied Enlightenment. (The book is available on Kindle.) We had a very good attendance for Amoda’s visit with us last month. Many of us are interested in reading and discussing her book. I found the book to be very beautifully written and a wonderful guide for spiritual unfoldment. I hope you can join us even if you have not read much of the book. Happy Holidays Dear ATS Friends. We had a great turnout for the SoulCollage card creations this month. For our next gathering on January 20, I will lead you through a meditation and exercises to determine and work with what your “Soul Values” are and how you might manifest them in the New Year. Our “soul values” come from the deepest part of us that is connected with the Consciousness/ground of being/essence. For those of you who created a SoulCollage card depicting what your soul wants you to manifest in 2018, please bring your card in with you so you can work with it. For those of you who were unable to attend the Dec. gathering and create a card, that won’t be a problem at all. Come anyway. Please let me know if you do plan to come within the next few weeks. Also, if you are planning to attend the Amoda Maa intensive on Feb. 10 from 12:30-4:30 and you haven’t yet let me know, please do so soon. Thanks and enjoy your holiday weekend. See below images of SoulCollage cards created by the group this month. 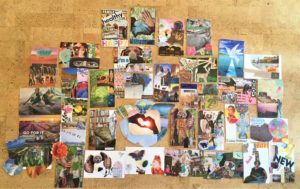 During our December gathering we wil be engaging in our yearly ritual of creating Soulcollage cards to bring in new energy and hidden wisdom from our deepest selves relating to what we want to manifest in the New Year. Creating soulcollages has become a yearly tradition for our group. I will also lead us through a guided meditation to help prepare us for manifesting whatever wants to come forth through the SoulCollage cards. If you have never created a Soulcollage card, please know that you don’t need to be artistic. All you need to do is to bring with you 8-10 pictures or photos from magazines that seem compelling to you. 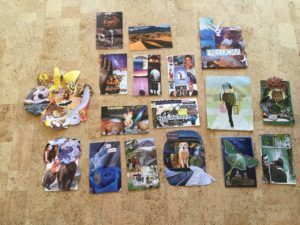 Your magazine pages will be added to the pages everyone else brings, and each person will create their Soulcollage cards from the collection of the magazine photos. I will supply the cards. Check out SoulCollages at Soulcollage.com or you can do a search under “Soulcollage pictures” to see examples of SoulCollages. I hope you can join us! Please RSVP by Dec.1 if possible. ATS Group is Now a Meet up Group! I just thought you should know that the Awakening to Spirit Group became a Meetup group this month. At our gathering on November 18 we had 5 new participants who found us through Meetup. Now word will get out more easily about our group. We are excited about that! It is wonderful to meet new people drawn to nondual wisdom spiritual teachings! 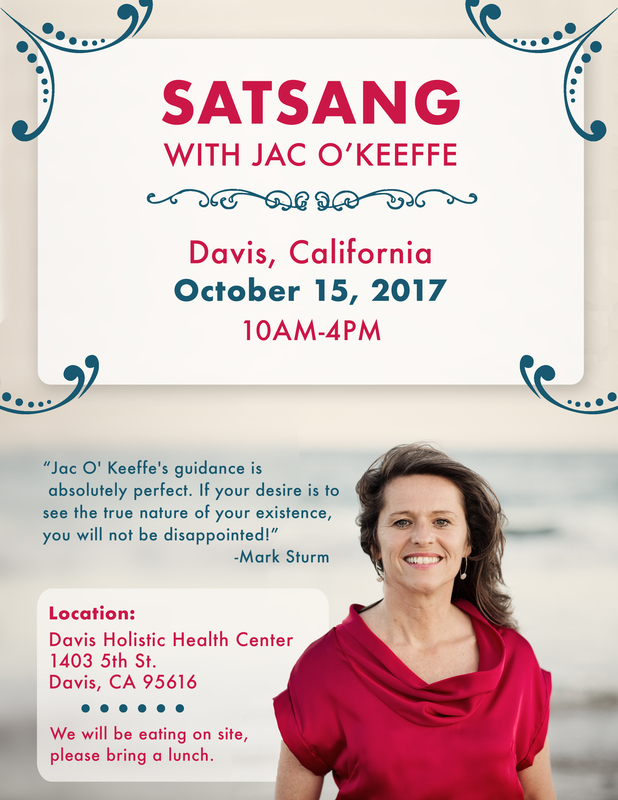 The all day satsang with Jac O’Keeffe in October was a big success! We all loved having her and hope to have her back with us next year. Our next gathering takes place on Saturday November 18 from 10 am to noon. I was just certified in Somatic Experiencing, a three year training process. I am now a “SEP”, Somatic Experiencing Practitioner. On November 18, I will lead you through a 25 minute meditation and then some Somatic Experiencing exercises for accessing the wisdom of the body. I hope you can join us. If you are new to this website and our group, please do not hesitate to email me to introduce yourself and ask any questions you may have. I am excited about the Sunday October 15th intensive with Jac O’Keeffe! She will offer a satsang from 10 am to 4 pm at the Davis Holistic Health Center at 1403 Fifth Street. Cost is $90 if you pay before October 1, and $100 after October 1 and at the door. To pre-register, pay before October 1 using the Paypal link on my website, https://soulwisdomtherapy.com/policies.html When I see that you have paid $90 I will know that it is for the Jac intensive. Please let me know if you’d like me to email you a receipt. I hope you can come! Please share this info with friends and family. Hello Dear ATS Friends and other Nondual Spirituality Followers. Our Davis monthly gatherings resume in August. On Saturday August 19 from 10 am until noon, we will continue to explore the teachings of Byron Katie, and how we can embody them so that they are not just a mental process for us.Check out www.byronkatie.com for more information on her “Work” for awakening. 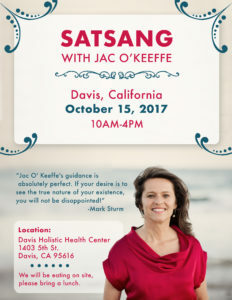 I am very excited about the upcoming daylong intensive with Jac O’Keefe on Saturday, October 14. Please take a look at her website and read about her awakening: https://jac-okeeffe.com/about Jac hails from rural Ireland but more recently has lived in Florida. We are very fortunate that she will be with us in Davis! With great gratitude and love of life in all its forms and formlessness. Hello Dear ATS members and visitors. We will be meeting again on May 13 from 10 am to noon. The theme will be working with Byron Katie’s “Work” to free ourselves from polarized thinking. I will be sharing a video of Byron Katie doing the Work with someone who struggles with Donald Trump. Then we will discuss the video and do our own work with “The Work.” Even if you have used this technique, I think you will find this gathering useful.